Welcome back, financiers! I was happy (and a little bit relieved) to receive a lot of positive feedback to my article last week. 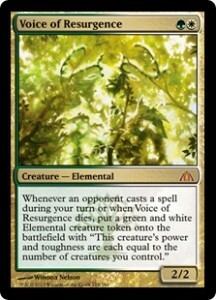 It looks like my year and a half writing for Brainstorm Brewery prepared me well for this jump to MTGPrice. One of the Facebook comments on last week’s article asked for discussion of a completely opposite topic: the cards that can’t be reprinted in Modern Masters 2015 and other upcoming supplemental products. I thought that was just a fine and dandy idea, since it keeps me from having to come up with another idea for this week. Let’s look at what won’t be reprinted in the near future, why it won’t be reprinted, and what to do with the cards—whether you have them or not. Oh, right, I almost forgot to explain the title of this piece. You see, because this article is the opposite of last week’s, I wanted the title to be the opposite to match it. The opposite of hot is easy: cold. 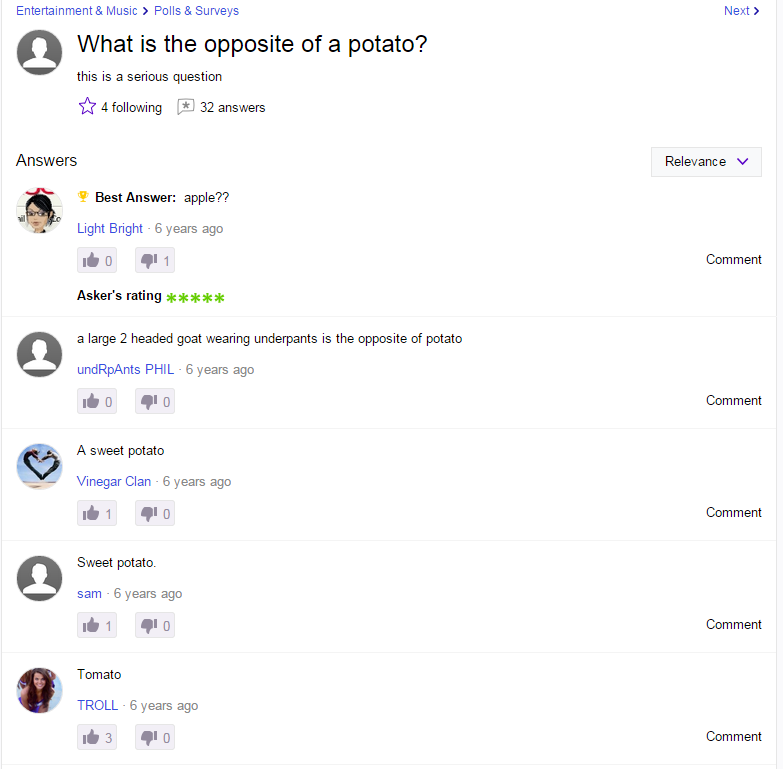 But what’s the opposite of a potato? Well you don’t have to Google that, because I already did that for you. I blindly clicked on the first few results, and I’ll let you see what I saw. 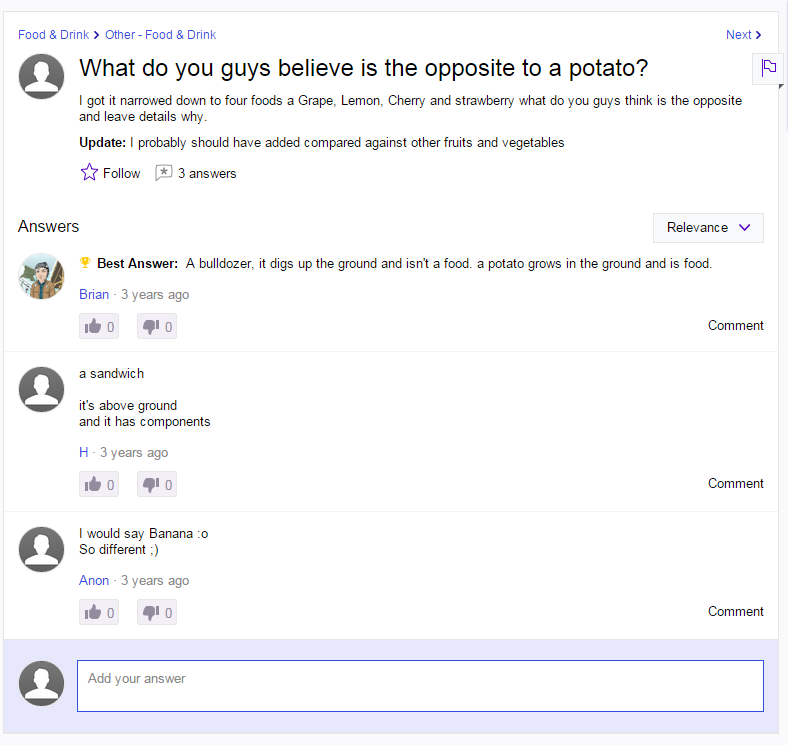 Interesting stuff, this internet thing has to offer. Where were we again? Right, Magic finance. Let’s get back to that. Let’s get the big one out of the way first. I get frequent requests to explain what to do with Captain Snaps now that he’s reached close to $50. He can’t be put into Modern Masters 2015 because the set only goes through New Phyrexia (which is one of the reasons he’s climbed this high already). He can’t realistically be put into Magic Origins, because that would require reprinting and creating a bunch of new cards with the flashback mechanic. They’re already bringing back double-faced cards from Innistrad as a mechanic (yes, I know it’s only for the five transforming planeswalkers), but I highly doubt they resurrect flashback along with that. So, what do we do if we have Snapcasters? If you bought or traded for a bunch of Tiagos back when they were $20 or $30, you’re in luck! You don’t need to be in a huge hurry to cash out, and you can probably continue to expect a steady climb into the $55 to $60 range. This is a classic example of the steady, consistent gains that I love to see in a spec. I’d start to move them toward the end of summer or start of the fall, just to be safe and lock in profits before anything is announced that could warrant a reprint. If you’re actively using them in a deck and don’t see that changing in the near future, I wouldn’t worry about unloading them. The utility you gain from holding onto them and playing them in actual events will most likely outscale the profit you gain by ripping them from your deck, selling them, and waiting for the reprint. So, what do we do if we don’t have Snapcasters? I’ve heard a lot of people suggest buying in now for the flip potential, because the $55 to $60 price range coming in the next few months is all but guaranteed. Personally, I couldn’t disagree more with this strategy. First of all, you’re tying up a lot of money over a long period of time. If you buy in right now at $47, and look to sell at $60 towards June or July, you’re making next to nothing after fees and shipping. There will most likely be multiple hot specs between now and then that could have made you a lot more money. On the other hand, what if you need them for a deck? What if you desperately want to play Splinter Twin, and have zero copies of Snapcaster despite the deck running a playset? Well, I think you just have to bite the bullet and buy them. Burn the $200 before you have to burn $240 later in the year, and at least you’ll get the value of casting them during the time you own them. The card’s not getting any cheaper. Try to forget about the fact that you didn’t get in at $30 and mitigate that error by getting in now. The good old $60 Standard mythic has been reduced to a token of its former self, hanging out at $18 ever since its rotation from Standard. It holds onto a relevant price tag thanks to seeing play in one of the stronger Modern decks of the format, and the fact that there were approximately seven packs of Dragon’s Maze opened throughout the entire world. It’s outside the realm of reprints in the near future, so do we want to pick itup at $18? My position on this card is similar to Snapcaster, so I should be able to save a few words here. If you need the card to play with in the Abzan deck, I recommend picking it up now. I don’t think it goes any lower than its current price, and the trajectory looks to continue on a plateau, maybe going up a couple of dollars over the next few months due to how few copies there are on the market. If you’re looking for a sweet spec target, I’d look elsewhere. If it does creep upwards, the trend will likely be too small to make a reasonable profit. It does, however, look like a nice trade target (along with Snap) if you’re trying to turn volatile Standard stuff into a secure chunk of value that won’t move for a while. Liliana is more expensive than Dark Confidant and has been for almost two months now. I don’t know why so many people are clamoring for another reprint of Bob when he hasn’t been seen in a top-tier Modern deck for a long time now. Liliana is by far the more powerful and popular card, seeing play in a variety of decks. She has a small reprint on the way in the form of a PTQ promo, but I don’t expect that to slow down her price growth very much. There won’t be a massive number of promos out there, and she’s certainly not going to be in any of the rest of the currently announced products for the rest of 2015. To be perfectly honest, I fully expect Liliana of the Veil to be the next $100 Modern staple, a price currently sustained only by Tarmogoyf. If you’re not using these (and you probably aren’t), I actually recommend selling them. While the card probably won’t be in Modern Masters 2015, it also hasn’t put up any significant results for a while. Bob has even seen a lot less play in Legacy lately, so I feel that a large chunk of its price is inflated by a combination of price memory and how iconic the card itself is. Trading Bobs into the other cards mentioned in this article will provide a much better return on investment in both the short and long terms. Speaking of mythic black cards from Innistrad: “Dead Mike” has slowly crept up the past year and a half from his low of $4 to the current price of $12. Although he obviously has zero competitive applications, his power level in Commander is not to be ignored. I play one myself in my Marchesa list, and I’m never disappointed to draw it. I don’t think this card stops creeping upward as the year goes on, and I can see it hitting $20 by the end of 2015. 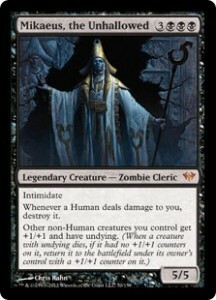 Foils are currently $32, and I’d get them now if you feel that you really need one for Commander, as there certainly won’t be any more getting added to the market anytime soon. Mikaeus seems like a Doubling Season-esque situation to me, where the card will invisibly creep up to $25 or $30, and everyone will wonder when that happened. Oh, Doubling Season is $30 again, by the way. And the judge foil can be found for $30 on eBay right now, with a few copies trailing behind in the $35 range. You can’t explain that. Decay has been sitting at a steady $12 to $13 for almost six months now, refusing to budge above that and break into the $15 range. What has changed, however, is the card’s buylist price. If you check out the blue line on our MTGPrice graph, the strongest buylist price has slowly crept up from $6, which is a 50 percent spread, up to $9, a mere 25 percent. I don’t need to tell you how powerful Decay is in both Modern and Legacy—you already know that. You probably also knew that this card was going to creep back up to $20, due to the fact that it will be hard to find a spot for a reprint in the coming months. I’m here to give you a thumbs up and tell you that you’re right. Abrupt Decay is a fine pickup in both trades and cash, assuming you’re looking for an extremely safe investment. I also want to touch on foil Decays. While it’s not impossible to reprint Decay due to its ubiquitous name (it doesn’t reference a specific plane, name, or faction, unlike Inquisition of Kozilek, for example), foils will be a lot harder to put into the market. 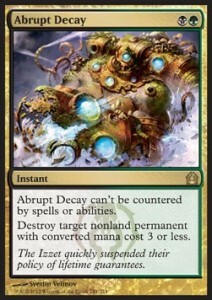 I can see Abrupt Decay being put into a Duel Deck product in the future (although they’ve already done Golgari ones to death), or a casual product like Commander, but the cards in those decks aren’t foil. Copies are approximately $75 at the moment, but they’re definitely safer from reprint than non-foil copies. I admit, though, that I don’t expect quite the same double-up with foils as for non-foils. Overall, I’m seeing a pretty similar trend in a lot of these “un-reprintable” (at least in the coming months) staples. If you can acquire them in trades by liquidating Standard staples, or cards that are ripe for reprinting, then I fully approve. I also wouldn’t disapprove if you were purchasing Snapcasters, Voices, or Lilianas for your own personal deck construction, because they appear to either be holding steady, or steadily creeping up over the course of the spring and summer. 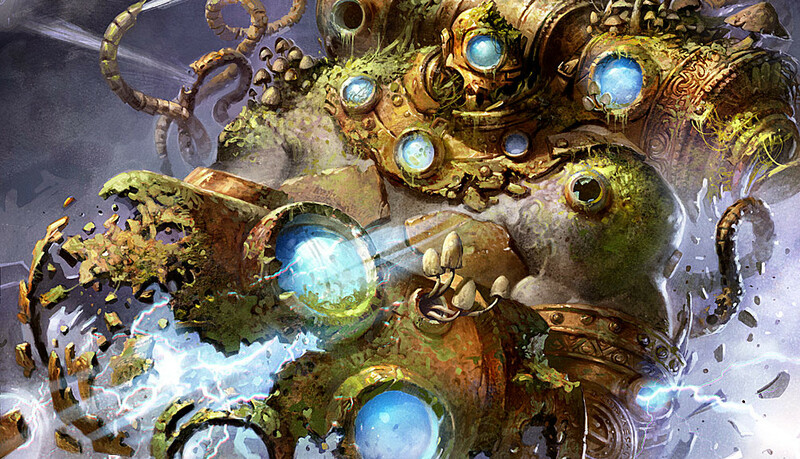 You still have a chance to liquidate all of your Zendikar fetches, Bolts, Probes, and Mox Opals before Modern Masters 2015 arrives, but be sure to pick up your staples that you’ll be needing before the full brunt of the storm arrives, too. Let me know if you have any questions, comments, or content that you feel needs to covered. I’m easily reachable through Twitter, Facebook, email, Reddit, or the comments section below. Thanks for reading! HA! Great title! Really liked this article. Probably going to out my snapcasters now though and just use the cash to buy more abrupt decay. Thoughts? Seems fine. 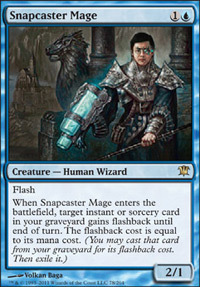 I expect a higher percentage return on non-foil Decay over the next six months compared to Snapcaster. Good stuff! I’m always looking forward on reading articles like this. Mostly confirming what I had in mind, but bringing some more in depth views on pieces of the puzzle I might of overlooked. Thanks and keep em coming ! I want to foil out my Zen fetches for my Commander deck, but don’t know whether to sell now and upgrade to foils, or sell now and wait for reprint (and not having a complete deck in the interim)? What do you suggest? There is no indication that a reprint is necessarily on the way. It’s assumed they will be in MM2015 or BFZ. The former is unlikely, and the latter isn’t necessarily a safe assumption at all. If you sell now with the understanding that they will be reprinted in the near future and thus more affordable as foils, you are taking the risk of them not being reprinted. The flip side is that they may well be reprinted. There is very little to assume one way or the other that a reprint is in the near future. I noticed no mention of Thoughtseize. It was recently reprinted in Theros which was pretty recent, and that version has been bouncing around between $15 and $20, the original lorwyn print looks to be slowly increasing in value. Just wondering if you had any thoughts or recommendations regarding to buy/sell/wait either non-foils or foils of both versions? thanks. ps love your articles, do you have a subscriber list? I think the lowest point that Thoughtseize hits will be a tiny dip as we approach rotation, but nothing too significant (maybe back down to $15 from the $20 it’s at now). Once bottoming out there, I expect it to very slowly creep back up to $25-30, following a similar trend to Snapcaster. Foils have dropped down quite a bit too, although I don’t expect them to bottom out at rotation like non-foils will. If you need either, I recommend getting in now, but it’s not a huge rush either way. I greatly (and respectfully) disagree with Sean’s opinion…I think there is no doubt that enemy fetches will be reprinted in Battle for Zendikar otherwise why revisit the plane now?? I’ve heard Wizards wants an even spread of nonbasic lands in rotation for Standard (which is why we had all the Shocks, all the Scrys, and Buddy/Friendly Fetches to balance the enemy pain lands). I believe we will be getting the Enemy Fetches reprinted in Battle for Zendikar, along with the buddy pains or the buddy check lands in Origins (just my opinion and anyone can disagree). I’d argue that the old border vs the new border matters a lot in foils. I don’t think that ZEN foils will hold nearly as much of a premium to theoretical BFZ foil fetchlands. Lol, that was my Doubling Season auction….I kept lowering it every day until it sold at $26.99 today.